Dog grooming franchise Barking Mad has celebrated the first franchisee to take up its recently launched mobile salon venture; Professional Mobile Dog Grooming. New franchisee Helen Burnham, a fully-trained City & Guilds level 3 dog groomer, will now operate her own mobile salon based out of Clitheroe, Lancashire, which will run alongside the chain’s own mobile branch in Barbon, Cumbria. Established in 2000 as an ‘alternative to kennels’ pet care service, bfa- approved Barking Mad launched its mobile grooming concept in October last year, offering “quality” dog grooming and dog washing via self-contained “state of the art” mobile salons which are equipped with electric grooming table, clipper vac and dryer, and dog cologne. Claiming to offer a “quality and lucrative opportunity”, the dog grooming specialist requires franchisees to have City & Guilds level 3 training and is able to offer this training within its franchise package for a fee of £11,950, with a lower fee of £9,450 for those already qualified. To mark the first year of its mobile grooming business, the pet care brand Barking Mad has also launched a prize draw competition to win a mobile franchise, with the main prize worth £11,950. “We frequently receive requests for a professional and reliable dog grooming service and our experience shows that a well-run franchise can expect to be booked up months in advance with repeat business gained by local marketing, reputation and referral. “The existing Barking Mad dog care network will compliment our grooming franchises well as we will have similar customers many of whom will know and trust the Barking Mad brand”. 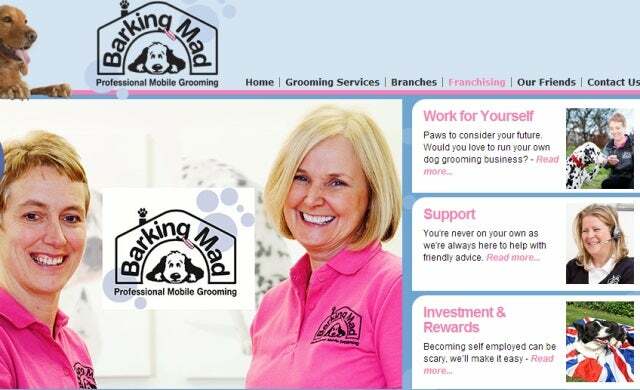 Find out more about the Barking Mad Professional Mobile Grooming franchise opportunity here.